Sunday started off so productive. 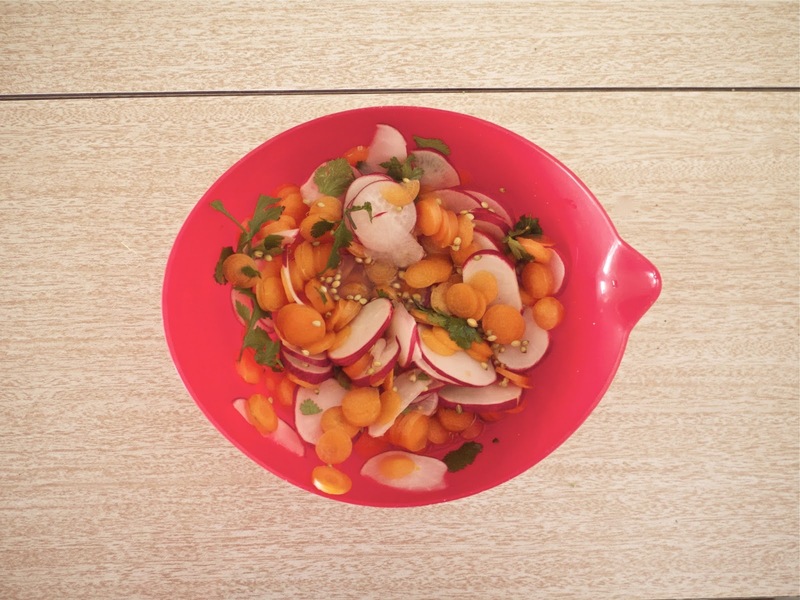 I did some deadline-y writing, I made a cake, Tim and I went to the vege market and I made these taco pickles with the fruits thereof (well, with the vegetables). Then a dark case of Sunday night bleakness set in, which I managed to largely see off with some West Wing and yoga. And then I lay awake for ages, as I do, but must have fallen asleep because at 1am I was zapped awake by another earthquake. Nothing huge, just a big rocking jolt that was over quickly, but every single one feels like it’s going to be the biggest thing ever. And then another largely sleepless night continued. But really: everything’s pretty okay. Sure, last Sunday’s big scary under-the-table-for-three-hours quake, and the aftershocks marching resolutely like the broomsticks in The Sorcerer’s Apprentice, really sucked. But I keep reminding myself that nothing broke, no-one broke, and I don’t want to expend all my resilience on this when I might need it for another time. Take it easy. Everything is cool. Chose the leafy bunch of cute tiny carrots for reasons threefold: to be annoying, they look cool in photos, and the tiny carrots are sweeter and less bitter than the bigger ones, so ha! Vindicated. Despite convincing myself I’m so relaxed and not uptight anymore about these silly earthquakes, while typing this very paragraph two small-but significant aftershocks shook the house. The resolve I pretended to have disintegrated a little. Honestly though, who am I kidding. Relaxed, me, ever? Don’t make me laugh. (oh, John Travolta in Grease, specifically. Such a babe.) So I guess what I’m actually saying is, everything is cool until it’s not, but I’ll worry about it then, and also probably during all the inbetween times, but also acknowledge always that things could be a lot worse and have been a lot worse for other parts of New Zealand and so on and so forth. And also just live in the now, or something. Luckily these super fast pickles haven’t disintegrated! Nice segue, yes? If not, just pretend it was, that might help. I discovered this recipe on evakolenko.com, a photographer’s website so stunningly beautiful that I don’t know why I even tried to recreate the recipe here, except that that I am audacious and incorrigible. These taco pickles immediately attracted me, with their swiftness of execution appealing to my ever-shrinking attention span, their translucent pink and orange discs of colour appealing to my sense of “hey that’s pretty”, and their vinegar-sugar-salt content appealing to my tastebuds, which are always craving sourness and sodium. Not to mention the very phrase “taco pickles” is kind of adorable. 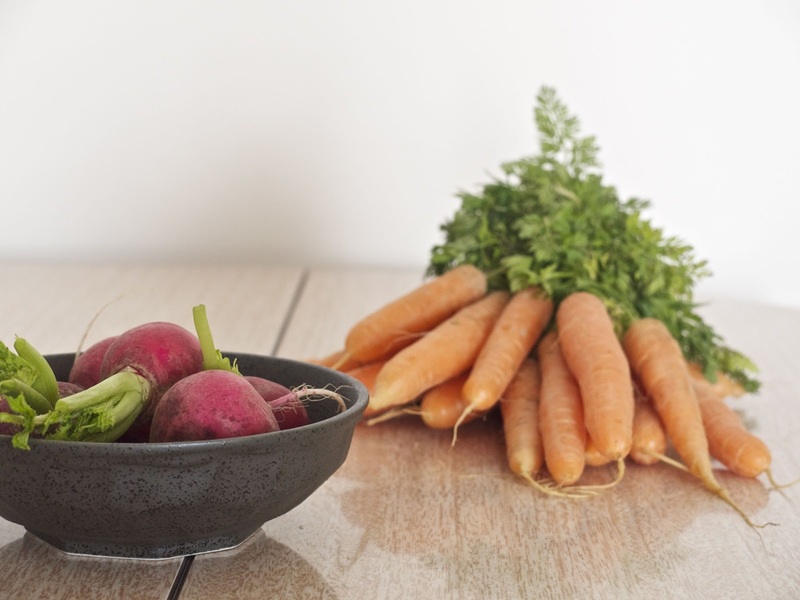 I would cautiously assume that any firm-textured or root vegetable could be used here, but the mild sugary-nutty flavour of carrots along with the cool peppery radishes is quite perfect. The only thing I did to change the recipe was add a few coriander seeds, which point up the lemony, herbal fragrance of the leaves and add to the crunch. The brilliant thing about these is that they are so quick and easy to make, and so very versatile. Heap them on top of rice, throw them in a massive sandwich, eat them with cheese and crackers, stand in the kitchen absentmindedly eating them straight from the jar with a spoon. adapted a tiny bit from a recipe by Eva Kolenko. 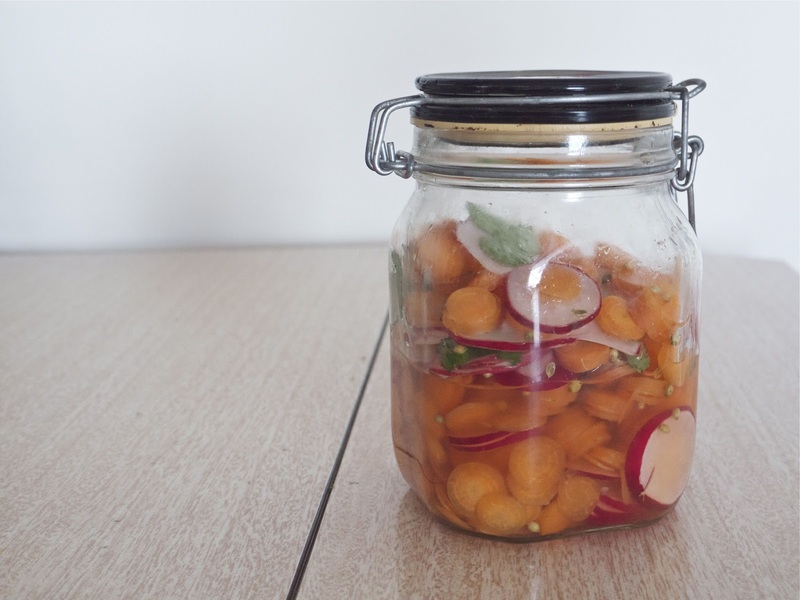 Get yourself an airtight jar – everyone loves them these days, so they shouldn’t be too hard to find. 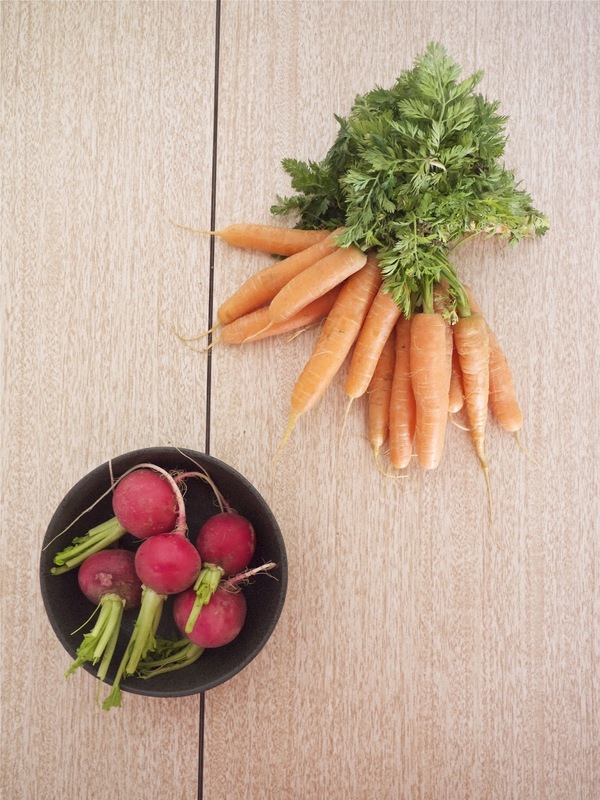 Scrub, but don’t peel your vegetables, and slice them as thinly as you can muster. I find a kind of rocking motion with a large knife against a chopping board is good, but as I went on I got lazier and the slices got thicker. Just do the best you can. 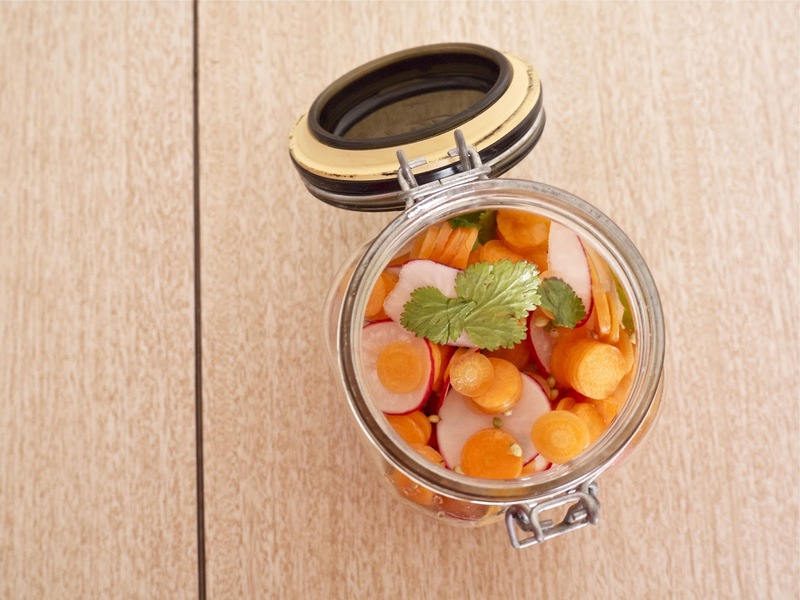 Once you’re happy with how full the jar is – it doesn’t matter if it’s not full, as long as it’s not overflowing – tip the vegetables out of the jar into a bowl. Bring the vinegars and sugar just to the boil, allow to cool slightly, tip over the vegetables and stir in, along with the coriander seeds and leaves, and as much salt as you like. I like a lot. Spoon all this back into the jar, pouring the liquid that remains in last of all. You don’t actually have to use this order of proceedings, I just found it useful so I could make sure I wasn’t overfilling the jar, and also it’s easier to mix everything in a bowl rather than the jar. Refrigerate, and eat within three weeks. As I said, these can be used many different ways, but the power of suggestion prompted Tim and I to make actual tacos, using some masa flour we got from La Boca Loca. It was all stupidly delicious. Warm, pliantly soft tacos, spicy tomato-rich beef, feta, crunchy vinegary vegetables, sriracha (we were, um, making do with what we found in the fridge, as opposed to being strictly traditional.) Our stupid stovetop kept turning off (it’s one of those weird newfangled flat-top touchscreen ones and it is a paaaaaain) so it took about an hour and much swearing to actually fry all the tacos, but even the slightly flabby undercooked ones tasted amazing. I got to hang out with this kitten and Tim’s aunt and uncle’s place. Unfortunately I got all cat-needingly wailingly hormonal afterwards, but at the time it was so fun. This little friend had the most satiny-soft fur. Coffee // 80c packets of off-brand poprocks // knitting, knitting, knitting // the aggressive joyfulness that is On The Town // beer with friends // more tattoo planning and txt conversations with Kate about all the ideas I have // tipsily plaiting my hair with that of two other friends into one witchy braid, just for fun // expending all the feelings I have left on Orange is the New Black // yoga // wedding planning // all the wine leftover from Tim’s and my engagement party // seeing talented friends playing live music // buying tickets for NZ Film Festival films // realising it’s less than a month till my cookbook, my cookbook is published for real. And I still adore this formica table. title via: look, this song Delicious Surprise by Beth Hart isn’t the coolest – I mean, that title. But, it is gloriously 90s with those guitars and Americana-aspirational lyrics and also I learned a dance to it at a workshop back in 2000 which I can still remember a tiny bit of, and there’s no better way to endear a song to me than for that to happen. Kate Bush, Running Up That Hill. There’s not much dreamier than this. There is thunder in our hearts? Swoon. Also it’s her birthday today. HBD, Kate Bush! Princess Chelsea, Monkey Eats Bananas. I love how sinister but playful this is. Also the rapid xylophone playing. Also the video rules. RULES. You’ve Got Time, Regina Spektor. Aka the intro music for Orange is the New Black. It has been in my head at least once an hour every hour every day. Watch out. Next time: the cake I mentioned that I productively made on Sunday is a lemon cake with white chocolate buttercream, and really delicious, so you bet your butts I’ll be blogging about it here next time. After your references to The West Wing and Fantasia in the first paragraph, I was going to be all fist-pump-our-sharedbrain-strikes-again, but then you called John Travolta in Grease a babe and my insides shrivelled up a little bit. HOWEVER. Pickles are one of my most favourite things ever, so I wholeheartedly love you once more. Obviously i need to incorporate pickles into my next tacos. How have i never had them! Love the title! Tasty looking pickle too! Awesome job and perfect at the carrots I just picked. And hello beautiful kitty! Cute carrots! And those pickles look really, really good. 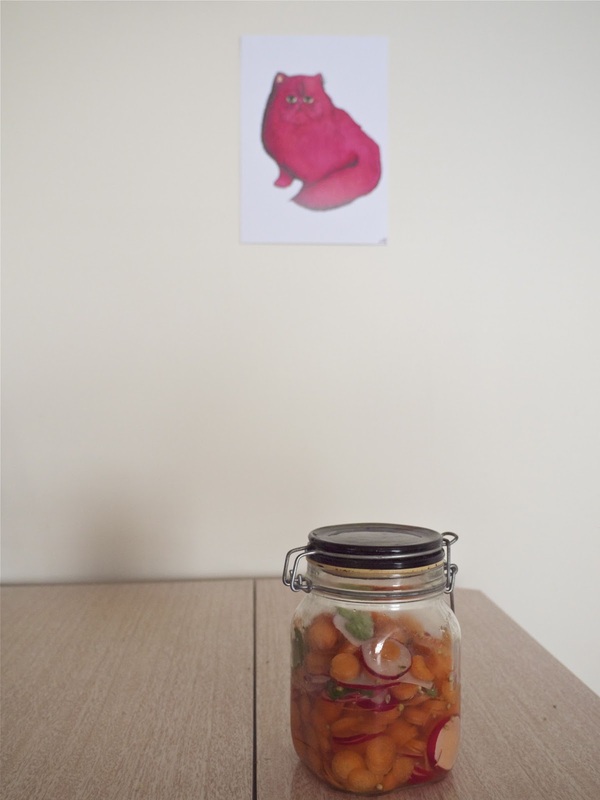 I love the jar too – how perfect!